The women’s varsity basketball team started the week with a 55-35 win over the Basic Wolves on Monday, Feb. 4 in an away game. Seniors Tia Thornton (#11) and Haley Morton (#45) scored 18 and 13 points respectively. The winning streak continued as varsity defeated the Tech Roadrunners 71-40 at home on Wednesday, Feb. 6. Senior Alexee Johnson (#35) contributed with 15 points while junior Gabbie Etopio (#15) scored nine. 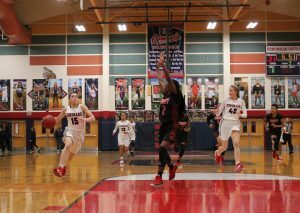 Varsity lost a tough match to the Liberty Patriots, 51-41 on Senior Night, Friday, Feb. 8. Morton scored the most for the Cougs with 10 points and senior Hamlin (#31) scored four. The regular season for women’s basketball is over, and Coronado ended with a 6-4 record. Their first playoff game is at Spring Valley on Tuesday, Feb. 12 at 6:30 p.m.
Men’s varsity basketball began the week destroying Basic 85-38 in a away game on Monday, Feb. 4. The Cougars defense held Basic from scoring more than 13 points per quarter. 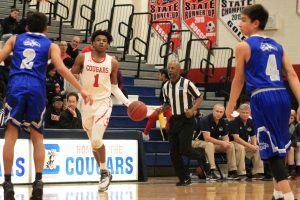 Junior Jhaylon Martinez (#33) scored 21 points and sophomore Jaden Hardy (#1) shot 13 points for Coronado. The Cougs beat Tech the second time this season 65-30 in an away game Wednesday, Feb. 6 but lost to Liberty 84-106 in a home game on Friday, Feb. 8. Despite Hardy’s 32 points and junior Tyrell Hunts 23 points, they failed to ever take the lead. Men’s varsity basketball is the second seed in the Southeast League behind Foothill. Their next game is a home playoff game on Friday, Feb. 15 at 6:30 p.m. Varsity wrestling placed 20 of 29 schools in the Class 4A state tournament on Saturday, Feb. 9 at Lowry High School. 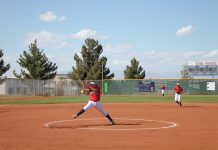 The Cougars defeated rival Green Valley 139.5-129. 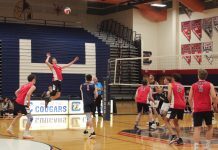 The Cougs finished off the season 3-6 overall and 1-2 in their league. Senior Jordan Marzka finished in fourth place at the state tournament, becoming the first ever CHS wrestler to appear on the podium at state. The men’s and women’s varsity bowling teams competed in the Desert Regional Tournament on Tuesday, Feb. 5. Senior Alexis Safley finished 6th place qualifying her for state. Safley then played in the class 4A state championship on Friday, Feb. 8 and placed 7th with a combined pin count of 1,123. Previous articleWhat trait do you find most attractive in another person?